Annals of Human Genetics has a long-standing reputation for publishing work of high academic quality. 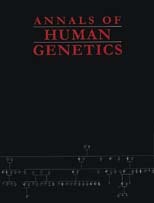 It presents the results of original research directly concerned with human genetics or the application of scientific principles and techniques to any aspect of human inheritance. Most papers address one of the following broad categories: biochemical and molecular genetics, human population genetics, gene mapping, cytogenetics, clinical genetics or mathematical models applied to sets of family or population data. Annals of Human Genetics is international in scope and each paper is refereed rigorously for originality and relevance.